Owen by only two points heading into the event. The Fall Final will also feature Late Model and DARE stock action spread out over the entire weekend. Speed51.com will be at the track and we’ll have a full report of the Mod Tour action after the race. 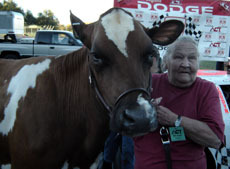 One of New England’s biggest racing traditions will take place this weekend with the running of the ACT Late Model Milk Bowl at Thunder Road Speedbowl The Milk Bowl is a race where the beauty queen is actual a real live Vermont Milk Cow and winners have been eagerly lining up to give the cow a post-race kiss in victory lane for years. Mike Rowe might have been the winner who made the most headlines during the Pullen Heavy Industries 400 weekend at Beech Ridge Motor Speedway, but he was far from the only victor there. Rowe won the PHI 300 event for the ING-PASS Pro Stocks, but he wasn’t alone taking a big check away from the Southern Maine oval. In a doubleheader for the PASS Modifieds, Troy Morse had the best weekend of everyone by winning on Saturday and finishing third on Sunday. Chad Dow finished last in Saturday’s race, but came back with a vengeance by winning on Sunday. Wayne Allard was the most consistent of everyone. He took runner-up finishes on both days. The NASCAR Whelen Modified Tour title fight resumes this weekend at Stafford Motor Speedway with the running of the Fall Final. The Stafford event, along with two additional Thompson events, is all that is left to decide the 2005 champion. During the four-day show, there were several races that were run. You saw in Speed51.com’s PASS Leftovers that Richard “Bubba” Pelton won the 75-lap Outlaw Pro Stock race in his wild green #27 [click here for more]. What you might not know is that Donnie Morse led 82 laps to take home the $5,000 winner’s purse from the PHI 100-lap race for Limited Sportsman cars. Morse held off Derek Kneeland and Terry Merrill for the win. In other Beach Ridge action, Brian Caswell won the Wildcat (also known as Strictly or Hobby Stock) feature over Skip Tripp and Jeff Moon. This #00 that Ben Rowe used to win the 2003 and 2004 TD Banknorth 250s now has a #10 on the side, it can be yours for just $8,500. 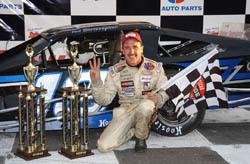 Ted Christopher leads the tour with seven wins in 16 races and a 61-point lead over defending champion Tony Hirschman. There are still a few long shots for the title as well. Chuck Hossfeld and Jerry Marquis could win it all if TC and Hirschman stumble. Eric Beers and Donny Lia still have a mathematical chance at it as well, but it’s not very realistic that either driver could make up the 300 or so points needed to get to the top. Racing legend Dave Dion will be entering the event this year, along with a full roster of ACT and Thunder Road regulars and several outside invaders. In fact, well over 60 entries are expected for the race. Jean-Paul Cyr has won the last two ACT races and looks to be an early favorite, but with so many cars entered and the ACT spec engine and shock rules to equal things out, anything can happen at Thunder Road. The event is a two-day show and Speed51.com’s Justin St. Louis will be there to bring you the full story. If the Fall Final or the Milk Bowl don’t get your juices flowing, there are a few other choices for race fans in New England this weekend as well. The NASCAR Busch North Series will run their only road event of the 2005 season on Saturday at Lime Rock Park (CT) and Speed51.com’s Matt Kentfield will be there to bring you the full story. The IBG-PASS Pro Stocks will decide their 2005 champion [Click here for the latest on the PASS title fight] in their finale at Star Speedway and Speed51.com will be there as well to bring you the full story. Also this weekend, Seekonk Speedway (MA) will host the two-day DAV race weekend featuring the True Value Modified Racing Series, NEMA and Ford Focus midgets and a $5,000-to-win Pro Stock feature. But that’s not even all, the Little Guys 100 Late Model race is set for Sunday afternoon at Oxford Plains Speedway (ME). If you’re into Pro Stock racing in New England, it could be time to start your Christmas shopping. While searching for parts and a new engine for the Speed 51 racetruck, we found several well known Pro Stocks that have for sale signs hung on them. The Whorff Motorsports car that Matt Kenseth drove to a third place finish in the 2004 TD Banknorth 250 at Oxford is up for auction on eBay [click here], while the Oxford Plains Speedway website [click here] lists a few racing machines as well. The car that Ben Rowe drove to 250 victories in 2003 and 2004, and was run this past season at Oxford by Chris Kennison, is up for sale with a price tag of $8,500 as a roller. Also on the Oxford website is a complete PASS car formerly driven by Bobby Cabral. The car is being sold by the family of his late car owner Steve Webster, who passed way earlier this season. This is what waits for the winner at T-Road.